America is the largest country without non-stop Capital-to-Capital service to China. Washington, D.C. and Beijing are two of the most important capital cities – global centers of politics, economics, and culture. Beijing has non-stop connections to most of the major capitals of the world, including London, Paris, Rome, Tokyo, Delhi, and Moscow. … European and Asian countries, such as the U.K., France, Russia, Japan and South Korea, are vigorously pursuing their commercial and political agendas in China. The advantage to these countries of having a Capital-to-Capital service is significant. And the lack of such a service puts the United States at a competitive disadvantage. Today, there’s an opportunity to change all that. After reading this, not supporting United almost seems unAmerican. The interesting fact buried within the content of the site, however, is that the US Department of transportation has already decided to award one new route to China. United’s campaign is not about creating the route, but about becoming the sole airline with the rights to fulfill it. Clearly, having a monopoly on this route would be a big money maker for United, and something worth investing in PR to win. 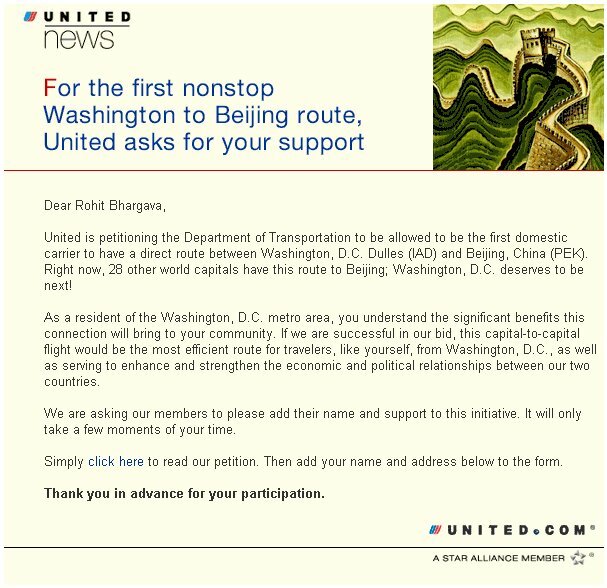 Yet regardless of the "massaging" of message the site engages in, it is still an interesting lobbying effort for United and a campaign likely to help them generate support from their many frequent fliers to win the Beijing route. To see the full text of the email promotion, click here.